My family has a thing for Chinese takeout, we just can’t quit it. I do try to limit how often I order, though, because it’s not the healthiest dining option. A few years ago I tried making my favorite Chinese takeout entree, Egg Foo Young, and it was an incredible success— it’s not an authentic recipe, but it’s super delicious and easy to make! It also satisfies most of my takeout cravings! That leads me to a new recipe that I made, inspired by another favorite Chinese takeout item— Egg Drop Soup. I have no idea why it took me so long to try to make my own Egg Drop Soup because it’s the most basic recipe ever. I almost feel dumb ordering it out now that I know easy it is to prepare, and I actually think my version tastes better. Oh, and did I mention this is 10 Minute Egg Drop Soup!? Yes! It’s ready in only 10 minutes! The great thing about homemade egg drop soup is that you can season the broth to taste before you drop the eggs in. For example, we’re big Sriracha fans, so we add a couple of drops to our broth (again, not authentic— but so good!). You can also make egg drop soup with corn, chicken, noodles, cabbage, and other veggies or additional spices….it’s totally customizable! 4 cups chicken stock – I used a good bone broth! Omit cornstarch is you like a thinner egg drop soup, alternatively, add an additional 1/2 tablespoon if you like a thicker soup. 1. Mix 3 1/2 cups chicken stock, ginger, garlic salt and pepper in a saucepan over medium-high heat. Stir cornstarch into the remaining 1/2 cup chicken stock and set aside. 2. In a small bowl, whisk 2 Eggland’s Best eggs. Set aside. 3. When seasoned chicken stock comes to a boil, add in cornstarch mixture. Stir. Add sliced green onions. 4. Bring broth to a rolling boil. Once achieved, stir the broth with a non-slotted spoon in one direction. While stirring, slowly pour in eggs. Eggs will cook as soon as they hit the broth. Top with extra green onions, if desired. 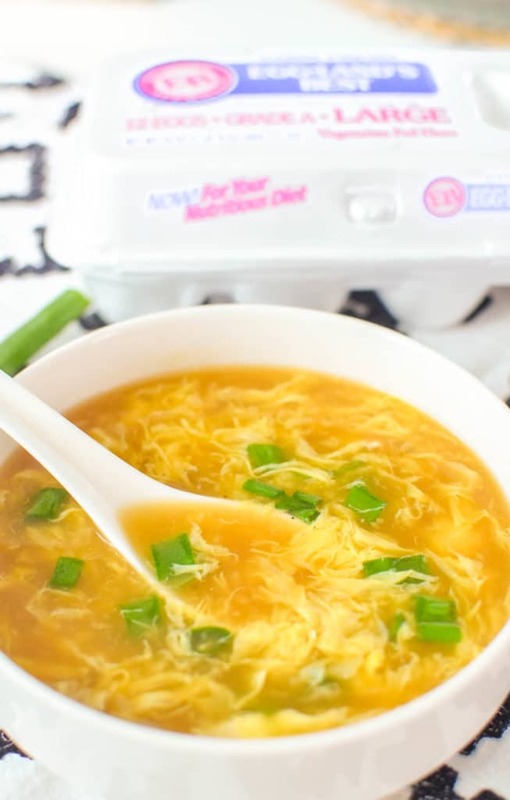 This Homemade Egg Drop Soup Recipe is just like your favorite Chinese takeout soup and only takes 10 minutes to make. Mix 3 1/2 cups chicken stock, ginger, garlic salt and pepper in a saucepan over medium-high heat. Stir cornstarch into the remaining 1/2 cup chicken stock and set aside. 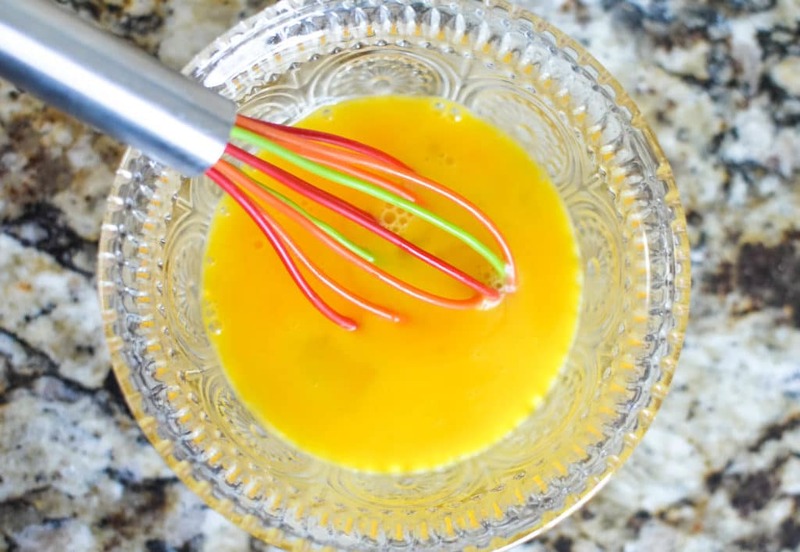 In a small bowl, whisk 2 Eggland's Best eggs. Set aside. When seasoned chicken stock comes to a boil, add in cornstarch mixture. Stir. Add sliced green onions. Bring broth to a rolling boil. Once achieved, stir broth with a non-slotted spoon in one direction. While stirring, slowly pour in eggs. Eggs will cook as soon as they hit the broth. Top with extra green onions, if desired. Technically, yes, egg drop soup can be frozen— but I wouldn’t recommend it after cooking as the eggs can get rubbery. Instead, make and freeze the egg drop soup broth and then add fresh eggs after it has thawed on the stovetop. 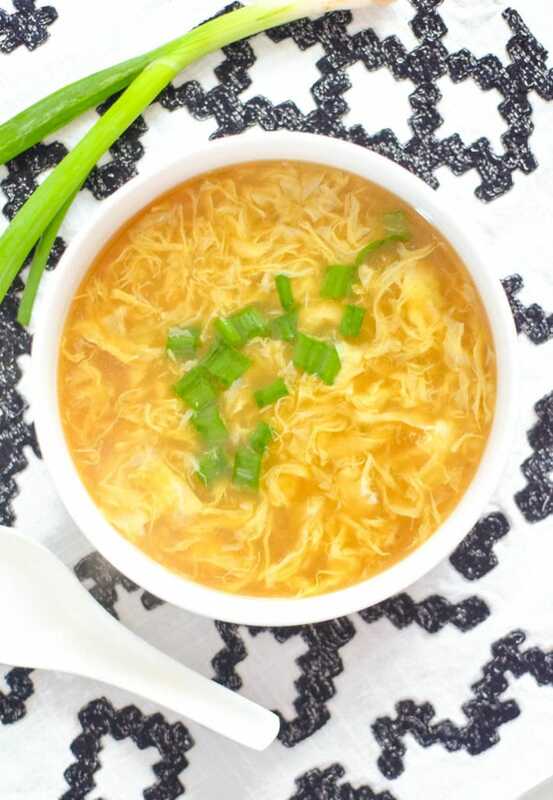 Is Egg Drop Soup Keto? This egg drop soup recipe is not keto as written. For keto egg drop soup, you would have to omit the cornstarch, which thickens the soup. Flavorwise, egg drop soup should taste the same with or without cornstarch. Good news! 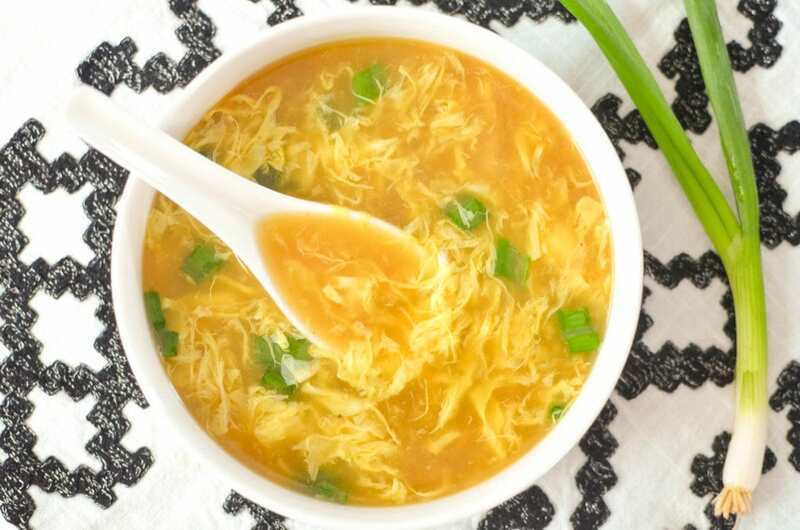 Egg drop soup is healthy and low in fat and calories per 1 cup portion size. If you’re watching your salt intake, choose a low-sodium chicken broth and omit garlic salt, or substitute with garlic powder. I love Strata with ham or sausage and cheese. love deviled eggs all year ’round. I love Korean style bibimbap with seasoned meat, vegetables, kimchi, and a sunny side egg on top. It is a excellent meal. I really love Western Omelettes. And broccoli quiche. My favorite is scrambled eggs with hot peppers. I love a ham and cheese quiche! We eat a lot of omelettes in my house. I like an egg scramble with sausage. I love omlets with cheese and turkey in them! I like Grecian Omelets or veggie omelets. I love making a good omelet! I like a good traditional quiche. I love eggs baked in portobello mushrooms. I think I may be really boring…but I just like scrambled eggs with a veggie in them. Zuchinni is my favorite. Thanks for the opportunity to win! We love omelets. There is so much variety when making omelets. Different meats, veggies, seasonings. My favorite egg dish is an omelet with bacon and cheese. Thank you! My favorite egg recipe is seafood quiche. I like a ham and cheese scramble. I love scrambled eggs with cheese. Also custards. Your soup looks delicious! I make chicken bone broth that would be great with this recipe. We are definitely an omelets household! A two egg omelet with crumbled bacon, diced onions, spinach, and cheese. SO good! It’s still my mom’s especially – scrambled eggs with cheese. We just gourmet-it up with some specialty cheddar! I love my Bacon and Cheddar cheese omelets with eggs! I love regular fried eggs with toast. We like making breakfast sandwiches and burritos. I’m a big fan of Deviled Eggs. There are so many ways to make them! My favorite egg recipe is simple… egg, cheese, and bacon biscuit! I love scrambled eggs! I like eggs over medium. I like a cheese omelette. My favorite recipe to make with eggs is a French Silk Pie! I like a ham and cheese omelette. I like a sausage and egg casserole. I like using eggs to make dumplings for my homemade soup! I think my favorite has to be Eggs Benedict. It is delicious, and can be healthy for you. This may be my new one! I’m definitely trying this recipe, thanks!!! I love my omelets a LOT too! 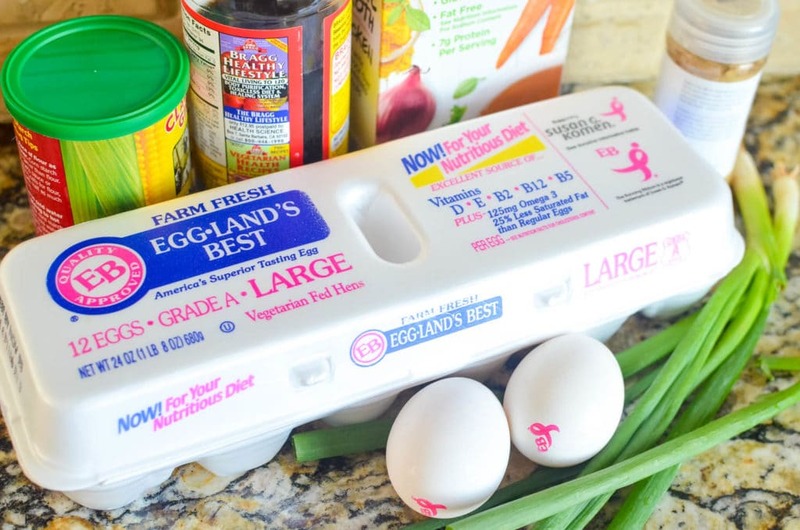 My favorite recipe using eggs is a vegetable omelet! I love poached eggs with hollandaise sauce and asparagus! My favorite egg recipe is egg salad. I don’t know that I have just one. My family loves my egg dish I make with sausage, onions, peppers, etc. Hard boiled eggs – I love to eat them plain, add them to salads, make egg salad – there are so many uses. i absolutely love eggs benedict. My mom makes an egg, sausage, and crouton casserole on Christmas morning that is my favorite! My favorite egg recipe is egg custard. Cheese omlette is my and my grandchildrens favorite. I love omelets. It’s so easy to have a filling omelet with just items that you have on hand even if it’s just eggs and cheese. I love quiche with ham and cheese. My favorite is an egg frittata. I just love to make a Denver Omelette. How delicious they are served up with Hash Browns. I just like over easy eggs w/ toast. I like omelets, quiche and scrambled eggs. My favorite egg recipe/dish is a frittata. My favorite is bacon and cheese omelettes. I love cheesy grits with an over easy egg on top. My favorite is deviled eggs, although a ham and cheese omelet is a close second. I love deviled eggs. Thanks for the giveaway! I like hard boiled eggs, egg salad. It would be a bacon, egg, cheese sandwich on a bagel. Poached eggs over hash browns. My favorite is an omelet made with eggs, peppers, onions, and cheese! You stole my thunder with egg drop soup. Big difference is, I use Better Than Bouillon instead of broth. Nothing beats (pun intended) a cheesy omelette. I love to make egg salad sandwiches! I make a goat cheese and tomato quiche. I like over-medium fried eggs. My husband makes them best. My favorite egg dish is my breakfast burritos! I like to do egg/cheese/spices wrapped in a tortilla! Yummy! Thanks and God Bless! I love cheese and scallion omelets! Love egg salad made with shredded cheddar and chopped black olives on sourdough bread. I love using eggs to make homemade cinnamon french toast. I love Egg salad sandwiches!! Especially with mayo! I love eggs in a basket or a nice cheesy omelet. Our favorite egg dish —> Huevos Rancheros !!! Egg and Bacon Omelettes are the bomb! My favorite recipe is the Egg Drop Soup Recipe. I love my daughter’s scrambled eggs. She uses such a perfect amount of butter and milk and cheese. And of course, eggs! I love an everything omelet with picante sauce.